The Central Division is proud to support a trust established in honor of a very special friend, patroller and mentor, the late Dan Somalski. Dan, as many of us know, dedicated much of his 25 year patrol career to helping others attain their goals both on and off of the mountain. 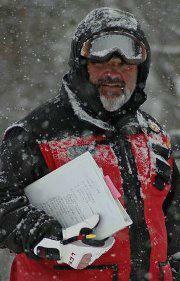 As a long time Certified (#426) and PSIA level 3 he was legendary both inside and outside of the traces. It is in memory of Dan's example that the trust was created to ease the burden of a patroller's credentialing costs while encouraging advancement. Eligibility - Any patroller, who is a member in good standing of the National Ski Patrol and the Central Division, may apply for an educational grant. The intended activities include (a) any National Ski Patrol education or other programs or activities, including but not limited to educational events such as the NSP Patroller Education Conferences, and (b) PSIA/AASI certification. Application forms are available online. The completed application form should be sent by email, fax or snail mail to Assistant Division Director Tom Anderson, who is one of the three Advisors to the Fund, who, as a committee, direct the fund in accordance with the Fund Agreement and these Guidelines. The three advisors consist of: (1) Louise Somalski or another Somalski family member or designee, (2) a current member of the Central Division staff and (3) a past member of the Central Division staff. A video of Dan Somalski. See below for Applying and Contributing to this fund. Please indicate that this is for the Somalski Memorial Fund.